Instead of meeting force with force, which many martial artists do, those who practice internal kungfu, like we do in Shaolin Wahnam, prefer flowing techniques which often exploit the opponents' momentum, and employ minimum force against maximum strength. In this second series, we share some of these techniques which are often used by internal kungfu practitioners. 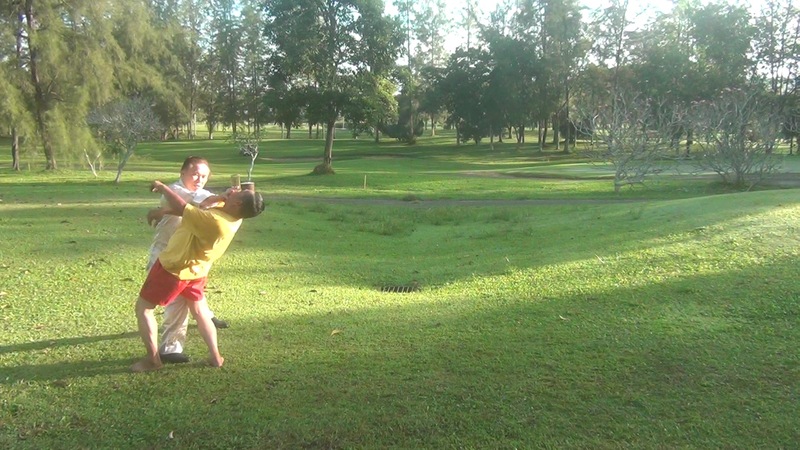 Teoh Cheng Keat executes a swinging hook at Grandmaster Wong's head. 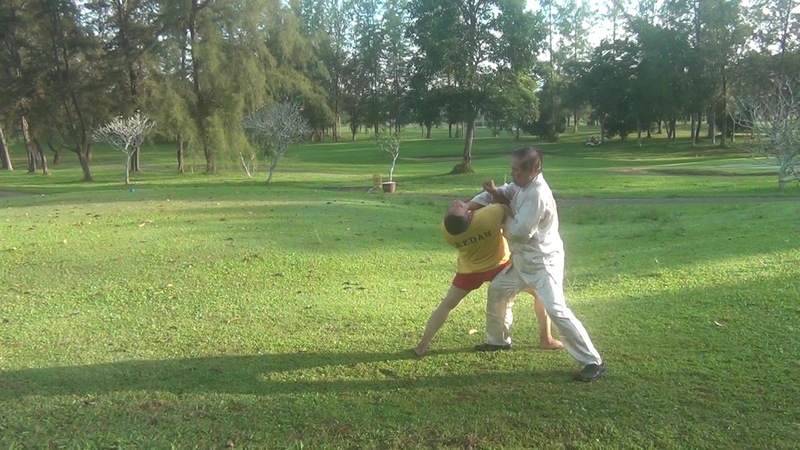 Grandmaster Wong moves diagonally to his left side to avoid the force of the swinging leg, lifts it up and grips the opponent's groin using the Shaolin pattern, "Bail Moon from Sea Bottom". Shaolin counters against Muay Thai (8) from Wong Kiew Kit on Vimeo. Teoh Cheng Keat rushes in fiercely to executes a knee strike at Grandmaster Wong. Grandmaster Wong retreats slightly to avoid the full force, sweeps away the knee strike and counter-strikes with his palm all in one smooth movement, using the pattern "Green Dragon Shoots Pearl". Shaolin counters against Muay Thai attacks (9) from Wong Kiew Kit on Vimeo. As Tech Cheng Keat jumps down with his elbow strike, Grandmaster Wong threads away the downward strike using "Golden Dragon Plays with Water", then attacks the opponent's face with a dragon-claw. Shaolin counters against Muay Thai attacks (10) from Wong Kiew Kit on Vimeo. 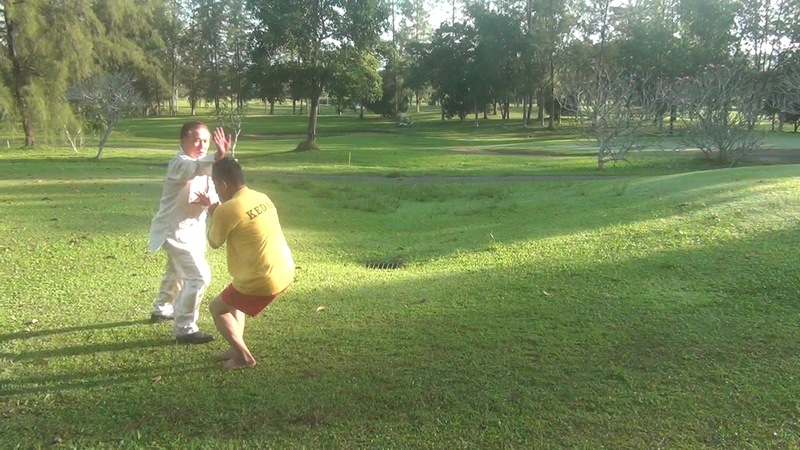 Grandmaster Wong applies a kick at Teoh Cheng Keat. Teoh Cheng Keat steps aside and kicks at Grandmaster Wong's standing leg. 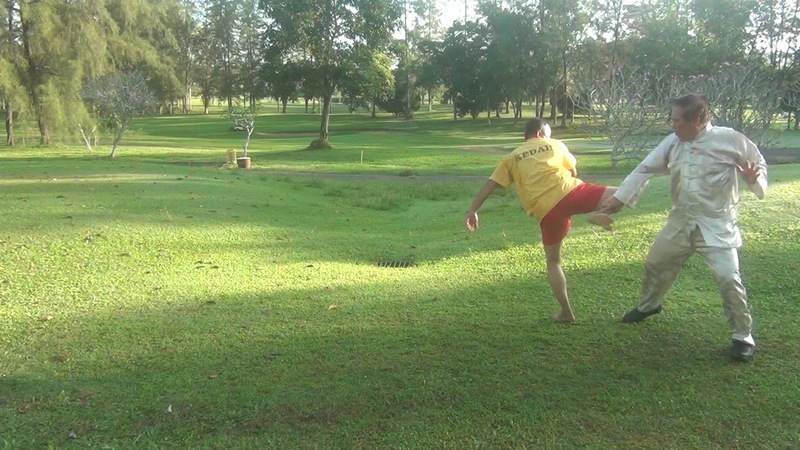 Grandmaster Wong uses his kicking leg to sweep aside Teoh's leg, then strikes Teoh behind his head. Shaolin counters against Muay Thai attack (11) from Wong Kiew Kit on Vimeo. Teoh Cheng Keat jumps down with an elbow srike. 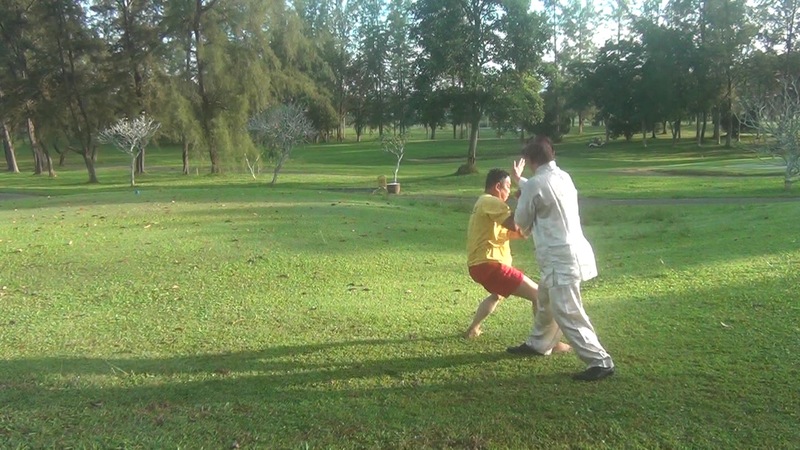 Grandmaster Wong avoids the strike and locks Teoh Cheng Keat's throat with "Golden Cockerel Locks Throat". Shaolin counters against Muay Thai attacks (12) from Wong Kiew Kit on Vimeo. As Teoh Cheng Keat rushes in with a flying kick, Grandmaster Wong retreats with "Tame Tiger with Beads" to avoid the kick, then covers the opponent and strikes him. Shaolin counters against Muay Thai attacks (13) from Wong Kiew Kit on Vimeo. Teoh Cheng Keat comes in with flying knees. Grandmaster Wong avoids the knee attack and wards off the opponent's hands using the pattern, "Separate Clouds to Look at Sun". Then he locks the opponent's throat using "Golden Cockerel Locks Throat". Shaolin counters against Muay Thai attack (14) from Wong Kiew Kit on Vimeo.